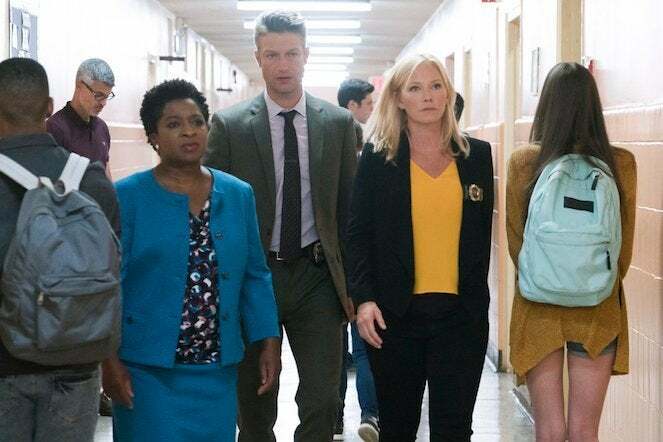 There are less than two weeks until season 20 of Law & Order: SVU premieres, and the series appears to be going all out. Photos from the upcoming premiere have been released by NBC. They tease a comeback full of action. Hopefully there is enough to go around, as the season will kick off with a 2-hour-long special episode. It will introduce a brand new character named John Conway, played by Dylan Walsh. Walsh is best known for his time on Nip/Tuck, and on SVU he is described as a respected member of his community and a "major beverage distributor." The episode also marks Gavin Riley (Mark Tallman)'s debut as a recurring character, though the squad will not be pleased to see him. In addition, season 20 adds George Newbern as Dr. Al Pollack, who appears to be a new love interest for Rollins. This premiere is big news for SVU. As of its 20th season, it is tied with both the original Law & Order and Gunsmoke for the longest-running scripted non-animated U.S. primetime TV series. 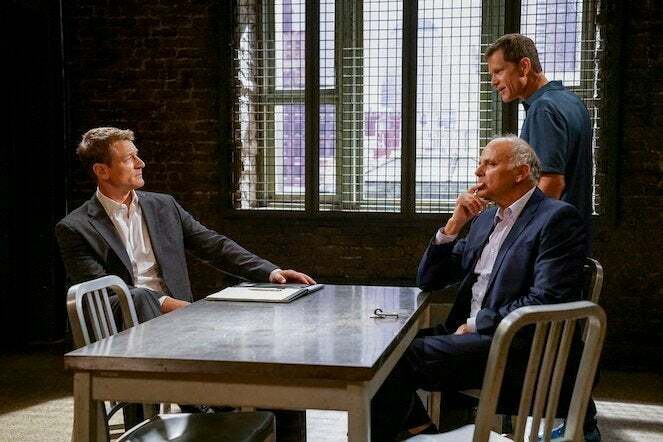 With both Law & Order and Gunsmoke long off the air, SVU has a serious chance at breaking their record, but this season is pivotal to that achievement. It will need to knock it out of the park to go further than any show has before. Judging by the promos we have seen so far, it intends to do just that. Here is a look at what we can expect in the Law & Order: SVU 2-hour special premiere on Thursday, Sept. 27 at 10 p.m. ET. Scroll on for your first look at the explosive season premiere! 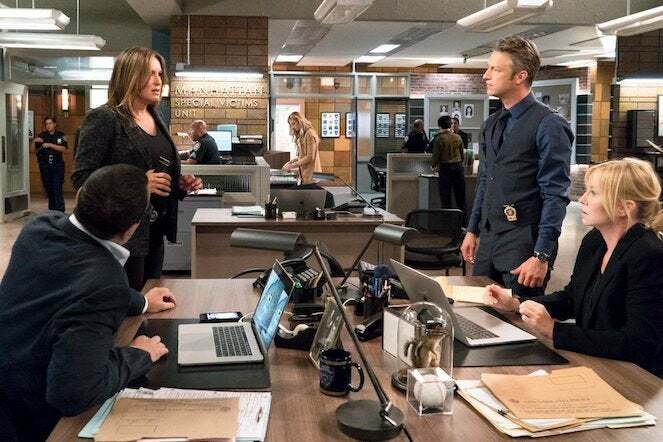 Lieutenant Olivia Benson and her team are back at it without missing a beat next week. The season premiere is titled "Man Down," leaving one ominous question for fans to tune in and answer: who? 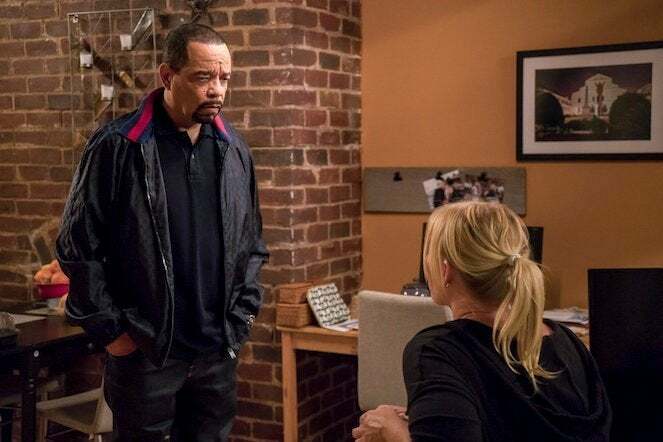 This will be Kelli Giddish's eighth season portraying Detective Amanda Rollins, and Ice-T's 19th season as Fin Tutuola. It looks like Detective Rollins' daughter, Jesse, is finally old enough to play a bigger role in the series going forward. Two young actresses have been cast to play Jesse, Charlotte and Vivian Cabel. The sisters will apparently take turns with the work, as many child actors have done before. George Newbern has entered the cast as Dr. Al Pollack, a new love interest for Rollins. The two look deadly serious at the table, though the orange juice in one glass indicates they might be out for a leisurely brunch. It is never a good sign when the Special Victims Unit is forced to enter a school. "Man Up" appears to feature plenty of kids, with several teens throwing harsh looks at the detectives and gritting their teeth against questions. The trailer for season 20 showed plenty of footage of Lieutenant Benson charging through the street, though it seems unlikely that a passing biker is the "Man Down" the episode's title refers to. Still, it is nice to see some action in store. 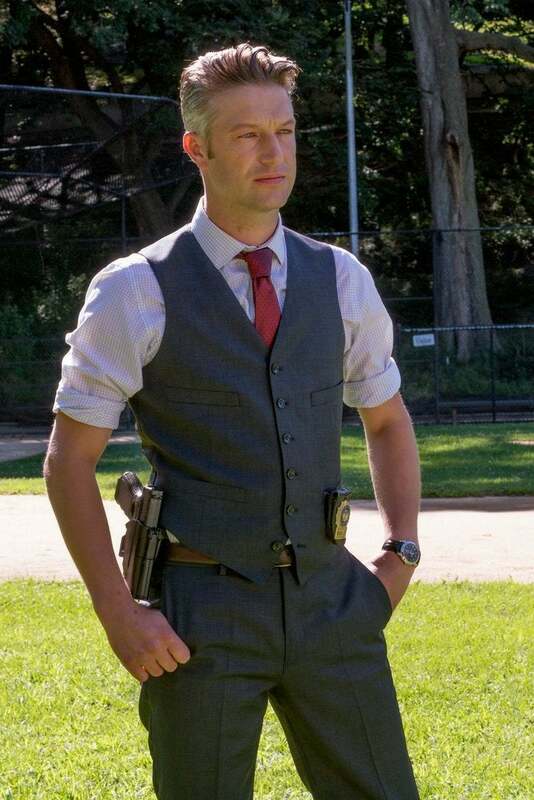 Something serious has drawn detective Carisi (Peter Scanavino) to a baseball field in the new episode, judging by the gun on his belt and the prominent placement of his badge. 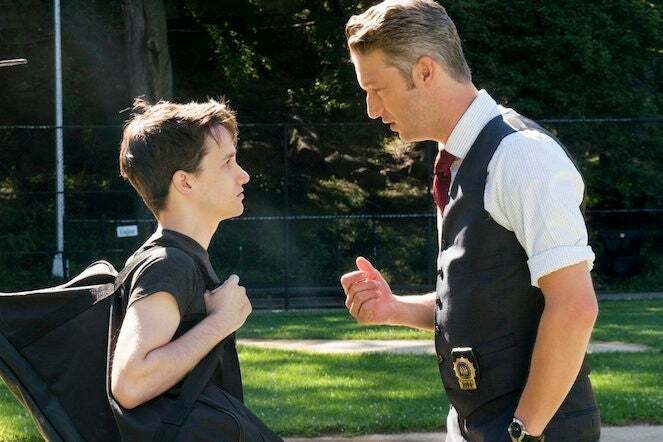 The detective can be seen hassling a teenage character named Sam Conway (Bryce Romero,) perhaps indicating a connection to our new character John Conway. One way or another, all procedurals lead back to the interrogation room -- complete with glinting chrome surfaces and tightly barred windows. it remains to be seen whether this is the first place we will meet John Conway (Dylan Walsh,) or how he ends up here.